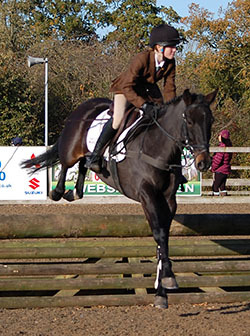 The third Open Young Eventing Pony Championships will take place on Sunday 3rd November 2013 at The College Equestrian Centre, Church Road, Keysoe, Bedfordshire MK44 2JP (note that this is an amendment to the date/venue published in the SPSS Year Book). 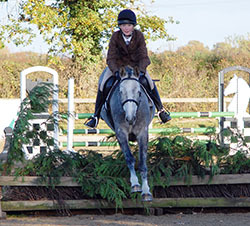 The Championships are open to 4, 5 and 6 year old ponies up to and including 148cms (149 cms with shoes) in height and riders can be any age (including adults). 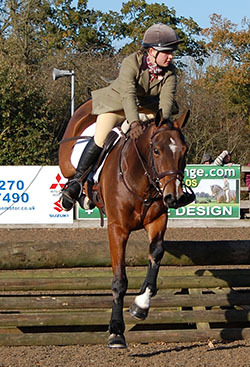 The Championships are sponsored by the SPSS and supported by British Eventing. The College is a top class venue and it's central location is easily accessible from the A1, M1 and A14. Running the event at The College will enable a more extensive and realistic cross country phase where the fences will be laid out to allow a reasonable pace and be more like riding cross country than doing a working hunter course. Spectators are very welcome at this event and a running order will be available including information about the breeding of each pony. The College Cafe will be open and there will also be information about the SPSS available. Entries are still open and there is still space. Entry Fee £35 plus the late entry fee of £5 (as the closing date was the 20th October). Late entries will be accepted up to the issue of times on the 1st November. The College will take entries over the phone (01234 708400) and then the entry form can be emailed, bought with you or even completed when you get there! Each pony will first perform a dressage test on an all weather surface. After a half hour minimum break for clothing & tack change, they will jump a BE equivalent single phase course of show jumps indoors then immediately move to the adjacent outdoor arena for a short course of portable XC jumps. This will typically be 5 fences below the maximum height followed by 5 at the maximum. 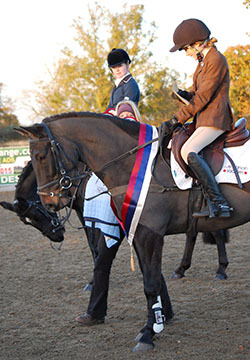 Due the low number of entrants, it will not now be practical to have the ponies judged separately from the other entrants, so they will be judged as part of the open classes within a special section so that the prizes and rosettes remain as per the entry form. The results of the class will be determined on a penalty score basis as per BE rules. The dressage score will be converted to penalties and added to the jumping and XC penalties. There will be no XC time penalties with the fastest time being used to determine the placings should 2 or more competitors have the same final score. Dangerous riding (including too fast) will incur elimination. More information on how the classes will be judged can be found below. Championships. The Overall Champion will be the pony with the lowest penalty score and the Reserve Champion will be the pony with the next lowest score. Judge/process change. Due to the low number of entries, the published judges (Nikki Herbert & Judy Hancock) will no longer be judging the class. Also, special score sheets will not now be used. Entry fee £35 per class. Entries close on 20th October - late entries are £5 extra per entry. Stabling: Stabling is available, Stabling is available, please contact The College on 01234 708400 to book. * Class open to PONIES only. * Ponies up to and including 148cm in height (149cm with shoes). Open to both British Eventing (BE) registered and non-registered ponies, owners & riders need not be BE members. Riders any age (including adults); size of rider to be appropriate for size of pony. * To be run under BE rules apart from the dressage test may be "called". Saddlery & Equipment and Competitors' Dress rules as per BE Members Handbook 2013 apart from the Show Jumping phase which should be done in XC clothes/tack as there is no time to change before the XC phase. Protective Headwear to current safety standards must be worn at all times while mounted (but does not have to have a BE or other "hat tag"). 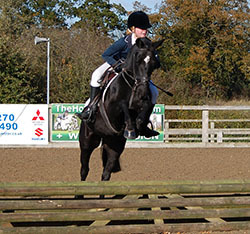 * Dressage tests can be downloaded from the BE website. 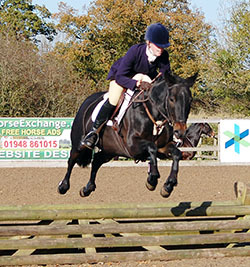 The aim of this Championships is to encourage the breeding and correct training of young ponies for eventing, with the best ponies being potential FEI Eventing Ponies. All ponies will perform their dressage tests at a time allocated in advance (see link from top of this page from 1st November). Dressage tests may be "called" if the rider wants. There will be at least a half hour gap between the dressage and jumping phases so that tack/clothing may be changed. Tack must comply with the BE Members Handbook 2013 Annex 5. Competitors dress should be in accordance with the BE Members Handbook 2013 Annex 6 (rules for BE80, BE90, BE100) and Protective Headwear must be worn at all times while mounted (but does not have to have a BE or other "hat tag"). Reserve Champions Fred & Charlotte Budworth are behind. Click here to download the Adobe PDF reader if you don't have it already. 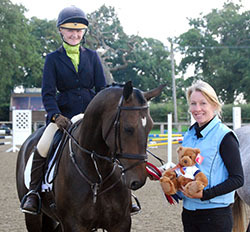 British Eventing have generously donated a training session worth approximately £50 to the top scoring pony in each of the 4, 5 and 6 year classes.